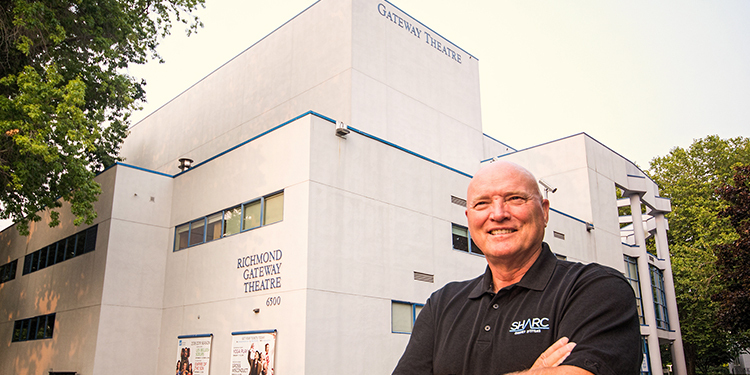 Lynn Mueller, founder and president of SHARC International Systems Inc., stands proudly outside Richmond's Gateway Theatre, heated and cooled thanks to his company's heat recovery system. Long-time Richmond resident Lynn Mueller is a man on a mission. Because of the company he started and runs, SHARC International Systems Inc., Mueller was named a finalist for the national Manning Innovation Award. “We see heat go down the drain. We recover all that heat when people shower, wash their dishes and all that stuff. We use it to heat more water or heat the building,” Mueller explains. SHARC’s heat recovery system works. It’s already operating at the False Creek energy centre under the Cambie Street Bridge. Energy that would otherwise be wasted is instead used to heat or cool 5,000 units in downtown Vancouver. In summer, instead of extracting heat, SHARC’s system dumps heat from the same buildings into the sewage water, allowing for the same system to air condition that million square feet at a much lower cost than usual. “It goes all the way, delivering heat and cooling, from Cambie to Knight Street,” he says. As big as that installation is, Mueller says it’s going to double in size. Six years ago, Gateway Theatre installed a SHARC system, becoming the first commercial building with the system. Mueller was a farmer in Alberta who became a refrigeration mechanic. For his work with SHARC Systems, Mueller was one of only three nominees in all of the BC/Yukon district for the Earnest C. Manning Innovation Award. All winners of this national award were from Ontario with three from Toronto and one from Ottawa. Mueller was thrilled to be nominated. With offices and sales on three continents, SHARC has gone global in their projects. When we think of sewage, we think of flushed toilets but, in reality, waste water includes water from baths, showers, kitchen sinks, dish washers, clothes washers. Most of our waste water has been heated before it flows out the drain.